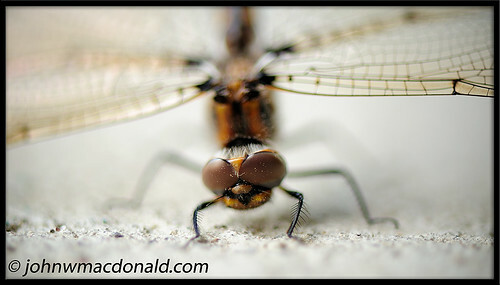 Dragonfly, originally uploaded by johnwmacdonald. Saw this fly on my doorstep yesterday after coming home from the Pico Iyer reading at St. Brigid's. It remained motionless save for a little foot motion every so often. I last looked out after dinner last evening and he was still there. It was gone by this morning though.